Calvin Kania is president and CEO of Fur Canada. He is seen here in his store with his executive assistant, Jialin. Calvin is a second-generation fur trader / fur manufacturer, and manufacturer of humane animal traps. He was raised on the family cattle ranch and fur trapline in the interior of British Columbia. Calvin emigrated to Canada from upstate New York in 1962 when he was 3 years old with his father, mother and siblings. His mother was a returning Canadian so immigrating and gaining the coveted Canadian citizenship was a formality. He obtained his Business Administration from Grant McEwan University in Edmonton, Alberta in 1986. He joined the venerable Hudson's Bay Company (HBC) Northern Stores Raw Fur Division in the 1980's where he gained his technical fur-grading experience. 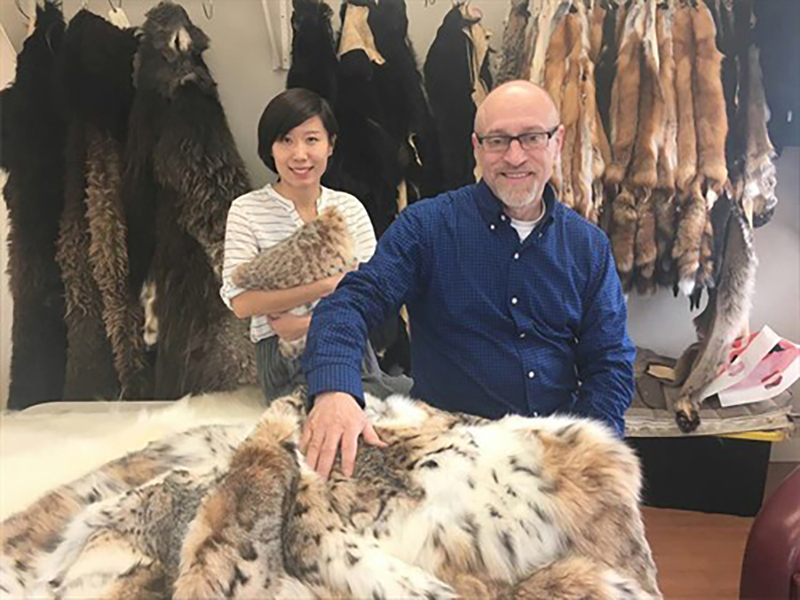 After years with HBC and a short stint at their Toronto Fur Auction House (currently North American Fur Auctions) he ventured out on his own to expand the family fur business. Today, Calvin is president and CEO of Fur Canada and Kania Industries, Inc., based in British Columbia. Fur Canada manufactures premium-quality fur blankets, pillows, and carpets from wild Canadian furs. It performs museum-quality taxidermy with a workforce of five dedicated employees on wildlife as large as polar bears, moose, mountain sheep, muskox and even narwhals. Kania Industries Inc. manufactures the Kania Trap 2000 not only for fur trappers but also for pest control, home owners, as well nut and fruit growers. Over 40,000 Kania Trap 2000's have been sold in the United Kingdom to control the over-population of grey squirrels as they are an introduced alien species. Calvin and his partner Greg reside on the west coast of British Columbia in Nanaimo, where he grows in excess of 2,000 tulips and 1,000 gladiolas annually as a hobby. Trapline tales: Ski Doos and marten scent, January 26, 2018. Trapline tales: Trail-building in the high country, May 17, 2018.